Opening of a new underpass with a mega artwork at Graz Main Train Station. the building is being rebuilt by the end of 2015 to a modern transportation hub. The completion of the northern underpass, designed by Zechner & Zechner architects with a 150 meters long artwork by Peter Kogler allows a new access to the station and represents a further milestone in the realization of the project. The new Leiner furniture store can be seen from a considerable distance as you approach Innsbruck from the East on the A12 motorway. The four story structure is a beacon, in Leiner’s corporate green, to people passing by. Along with the large areas of green, the angular form of the building itself makes a strong impression. Architekturbüro mit Schwerpunkt für Stadtplanung, Verkehrsbau und Wohnbau : Zechner & Zechner architects Vienna, architecture and urban development. Martin Zechner (*1962) and Christoph Zechner (*1961) were born in Graz, Austria, and studied Architecture at the Technical University of Graz. After working with several architects in Austria (Arch. Plottegg, Arch. Kada, Arch. Domenig), Germany and Switzerland, they set up their own office “Zechner & Zechner” in Vienna in 1988. Right now 30 architects and technicians are engaged in the Z&Z main office in Vienna. After winning the “Corporate Design Competition for architecture of the Austrian Railways” in 1990, an intense activity concerning traffic architecture started. Especially architecture for railway-stations was the main engagement of Zechner & Zechner. Zechner & Zechner set into practice many buildings for railways in between the program “Corporate Design for The New ÖBB”, “New Offensive for train stations” and the “high speed- track Vienna – Salzburg”. Further buildings concerning housing (Europan 1 , Jeglitschgründe Leoben [1999-2006], Laaerberg Vienna , Stella Zwei – Vienna  followed. Winning architecture competitions led to contracts for building the new leisure centre for Amstetten, the new Airport-Tower at Vienna´s International Airport or the new Marriott hotel in Vienna. The office is involved in many traffic and infrastructural projects ongoing. 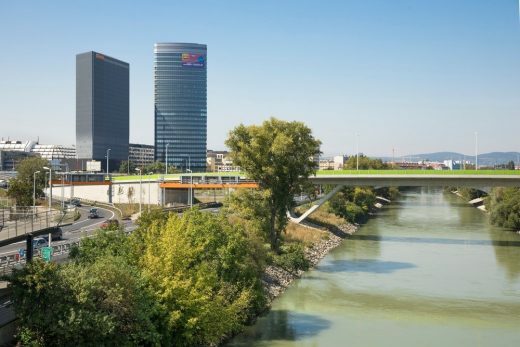 Among other projects the architectural design of bridges and other traffic- buildings, urban developments and complex multifunctional buildings are the main interests of Zechner & Zechner. At the moment Zechner & Zechner is a member of the design-team for the New Main Station in Vienna, a project which will have an investment over € 600 Mio., is working on the skyscraper project for the new headquarter of ÖBB and on several office-buildings and shopping centres. Zechner & Zechner´s engagement in urban design and large-scale buildings led to several commissions abroad. Projects and competition entries in Moscow, Kiev, Warsaw, Budapest and St.Petersburg are in planning stages or amongst construction phase. Zechner & Zechner´s buildings were awarded many times. Among others with the European Steel Design Award, Brunel Award for outstanding design in railway transport or the AR-Award for emerging architecture. November 1, 2017 in Architects.